And why worry about clothes? Look how the wild flowers grow: they do not work or make clothes for themselves. Look how the wild flowers grow: they don’t work or make clothes for themselves. Jesus gives the reason why his disciples are not to worry: “See how the lilies of the field grow.” This expression draws to mind God’s provision in nature for flowers growing wild, which probably surrounded Jesus, the disciples, and the crowd as he spoke. Even today, red and purple anemones with crowning ten-inch stalks, along with blue irises, grow wild on the hillside above the Sea of Galilee. The beautiful flowers surrounding Jesus elicit a striking contrast to Solomon’s royal robes: “Not even Solomon in all his splendor was dressed like one of these.” Solomon’s wealth prompted the visit from the Queen of Sheba and his life became a proverbial success story (see 1 Kings 10:1–29; 2 Chron. 9:1–28). Yet God’s provision for wild flowers causes them to be more beautiful, if one would only look. The emphasis shifts slightly to regard lilies as the clothing of “the grass of the field” (6:30). The green grass of spring when cut, dried, and bundled was a natural source of fuel for fire ovens and was a common biblical metaphor for dramatic changes of fortune and for human frailty and transience. If God’s sustaining care extends to such a transitory part of his creation, “will he not much more clothe you, O you of little faith?” Those with eyes of effective faith will see the beauty of God’s creation in contrast to human efforts at splendor and will learn daily how to follow God’s guidance and how to trust in his gracious provision. “Little faith” (oligopistos) is a favorite expression of Jesus, found mainly in this Gospel.16 It is only directed to Jesus’ disciples, indicating that “little faith” is not absence of faith but deficiency of faith. These passages have nothing to do with works. We should be so on fire for God; we should be going day and night. Nothing should be able to stop us, and we should be so sweet, and so pleasant, and so kind, so Christ-like in our lives. It takes every day's life. Jesus said, "Consider the lily of the field, how it grows, toil and spin; yet I say unto you that Solomon in all of his glory is not arrayed like one." Solomon had robes that was arrayed with glorious silk and needle work and things, but that--that didn't--that wasn't what He was talking about. In order for a lily to grow, it has to toil both day and night. What do you want to come up back here on the little end of the line for? You know, we get up here as ministers, and we speak, and we're always giving out to the people everything that's in us. I preached a subject one time, where Jesus said, "Behold a lily, how they neither--neither toil nor spin, and yet I say unto you that Solomon in all of his glory was not arrayed like one." And I find out, the lily has to grow, day and night, spin, toil, and to make itself radiant. William Branham completely contradicts what Jesus was saying. 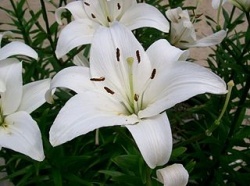 Jesus said in both passages that the lilies do not work. But William Branham turns right around and says that in order for a lily to grow, it has to toil both day and night... And I find out, the lily has to grow, day and night, spin, toil, and to make itself radiant. This is a total contradiction to what Jesus said. ↑ Biblical Studies Press, The NET Bible First Edition; Bible. English. NET Bible. ; The NET Bible, Mt 6:28 (Biblical Studies Press, 2006). ↑ American Bible Society, The Holy Bible: The Good News Translation, 2nd ed., Mt 6:28 (New York: American Bible Society, 1992). ↑ Biblical Studies Press, The NET Bible First Edition; Bible. English. NET Bible. ; The NET Bible, Lk 12:27 (Biblical Studies Press, 2006). ↑ American Bible Society, The Holy Bible: The Good News Translation, 2nd ed., Lk 12:27 (New York: American Bible Society, 1992). ↑ Michael J. Wilkins, Matthew, The NIV Application Commentary, 298 (Grand Rapids, MI: Zondervan Publishing House, 2004). This page was last edited on 5 May 2017, at 11:13.